Chevy packs the new Camaro with updated looks, a better interior, and the latest infotainment tech. It doesn't try to live up to any Legacy, but writes an entirely new page for the Camaro. It’s easy to forget how important a car like the Chevrolet Camaro is to American car culture. When it was first introduced, it served as General Motors’ mighty counterpunch to the iconic Ford Mustang. Ever since, Pony Car battle lines have been drawn along those manufacturer allegiances. It’s that audience you must consider with the completely redesigned 2016 Chevrolet Camaro. It might look like a clever update of the 2015 model, but it's an entirely new car, riding on a platform shared with the Cadillac CTS and ATS. That means there's a new level of refinement at play, but it’s not all rosy for the Camaro, as the previous model had some serious setbacks that negatively impacted its usability in daily driving. So did Chevy take advantage of all the positive attributes offered by sharing a platform with the CTS/ATS? Or did it fall into the same pitfalls? 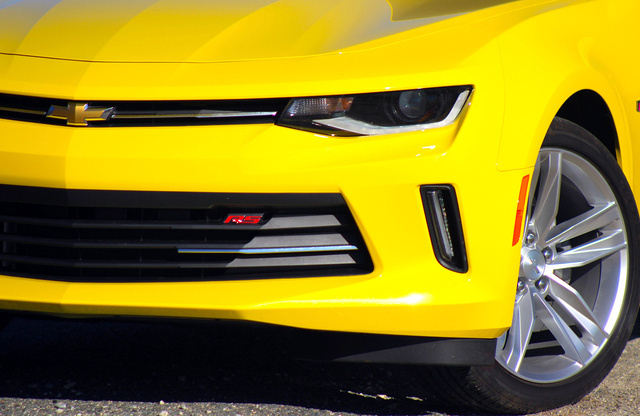 The first thing you’ll notice is that the Camaro’s styling is firmly planted in the 21st century. No more looking back with the retro craze that was prevalent in American automotive styling in the 2000s. Lines are tight, crisp, and forward-looking. The essence of certain design elements has been retained from the outgoing model, such as the upper border of the headlights and grille, but below that, it's a completely different vehicle. From a full-on side view, you can actually start to see the Cadillac coupe profile. The C-pillar rises from almost the back of the car, and the result is a somewhat “hunchback” look from certain angles. But chances are you’re too fixated on the Michael Bay-approved headlights and concept-car styling cues to truly notice just how much the silhouette of this car has changed. Inside, things move forward in a great way as well. The previous interior paid homage to the first-generation Camaro, and ergonomics suffered. The new interior has a style all its own and thankfully boasts function to match the form. The cabin features several color-changing light strips in the interior that can be matched to Touring, Sport, and Snow/Ice drive modes (more on those later), but can also be unlinked and customized using dozens of colors. You’ll have to dig through the vivid MyLink touchscreen to find them, but it's certainly worth it to add a personal touch to the interior. This is why you came here, right? The Camaro is a performance coupe at heart, and that’s where the shared Caddy platform comes into play. 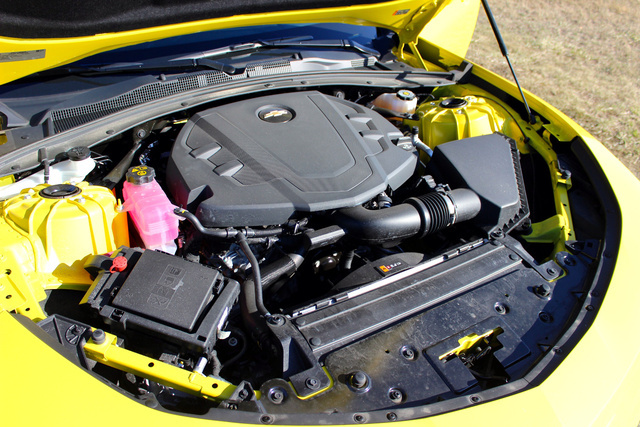 The base engine is a turbocharged inline 4-cylinder that makes 275 horsepower and 295 pound-feet of torque. 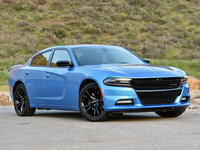 All trims (save for the SS) start out with the turbo four, and from there you can opt up to the 3.6-liter V6 (a $1,495 option), which makes 335 horsepower and 284 pound-feet of torque. The iconic Camaro SS features the 6.2-liter LT1 V8 right out of the Chevrolet Corvette. It makes 455 horsepower and 455 lb-ft of torque. Power with all of these engines is sent to the rear wheels through either a 6-speed manual transmission or an available 8-speed automatic transmission. Straight-line power from the SS is undisputed, but my time on the track has taught me that V8 engines can be rather nose-heavy. A V8-powered car can power out of a corner strongly, but you will still have to brake hard. The new V6 Camaro is 300 pounds lighter than the outgoing V6 model. Taking corners in our V6 test car, the steering felt very well weighted, and the connections to the CTS (especially the V6 model) are indisputable from the driver’s seat. Directly aft of the shifter is the Drive Mode selector, which provides Snow/Ice, Tour, and Sport modes (SS models get an extra Track mode). Each mode has a unique combination of tuning for throttle progression, shift points (in automatic models), steering response, and stability-control sensitivity. Sport mode also engages the available dual-mode sport exhaust. Even in our V6 test model, it let out a raucous howl. If fuel economy is your main concern, the best performer is the turbo four with the 8-speed automatic, which returns 22 mpg city, 31 highway, 25 combined. Our V6 automatic test car achieves 19 mpg city, 28 highway, and 23 combined. The worst performer is the V8 SS with a manual, which returns 16 mpg city, 25 highway, 19 combined—still respectable numbers for a V8. 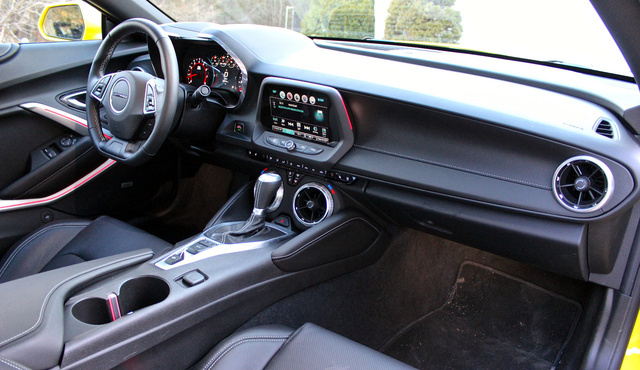 The interior of the 2016 Camaro is light years ahead of the previous-generation car in terms of ergonomics. Getting in and out appears to be easier, and the controls, while still unique styling-wise, are easier to use. 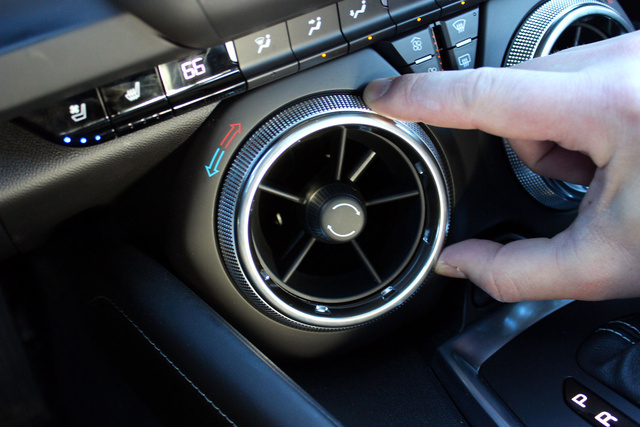 Models equipped with dual-zone climate control have a temperature selector integrated into the frame of each of the two center-console vents, a clever design. Despite advances in ergonomics, the cabin of the Camaro still favors stylistic form over true everyday function. The center console lid is a long, flowing cover, but opens up to a center-storage bin that is about two-thirds the size. It’s awkward to lift. And with a low-slung coupe like this, rear-seat space is almost negligible. That space will work better for a backpack or your jacket than a passenger. Trunk space is rather impressive for a vehicle like this, but the opening is small, so large items might not fit through. Golf or weekend bags should be fine. Chevy’s latest version of MyLink is one of the better infotainment systems available today. One of the mistakes some automakers have made when designing touchscreen layouts is cramming too much onto one menu. The MyLink layout is like that of a tablet, but with larger icons that are easy to see and accurately press while driving. Our test vehicle also featured CarPlay, which is Apple’s in-car operating system for getting the most out of your iPhone while driving. The Camaro didn’t come with a navigation system installed, but a driver could easily access the iPhone’s maps app from the CarPlay screen. You can even search for a destination from your iPhone, and when you click “Go,” it will present directions on the touchscreen. 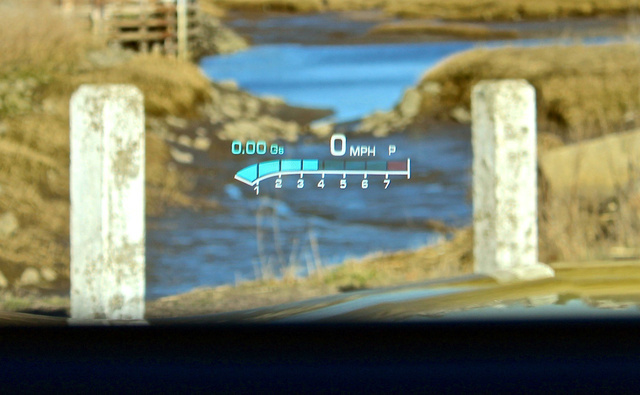 The Camaro also had a head-up display (HUD), which provides information like vehicle speed, radio-station info, engine RPM, and turn-by-turn navigation instructions. It's my belief that HUDs are so helpful in keeping the driver’s eyes forward that they should be as common in cars as rear-view cameras. The Camaro comes with safety features such as StabiliTrak stability control, traction control, advanced dual-stage airbags, and a standard backup camera. As part of the Convenience and Lighting package, features like rear park assist, blind-spot monitoring, and rear cross-traffic alerts (which will tell you if a car is headed your way while backing up out of a spot) were all featured on our test car. But the Camaro cannot escape a burning truth: its bold styling yields some of the poorest visibility you can get in a modern car. It’s true that many new vehicles have larger aft pillars for design and structural reasons (recently updated rollover standards mean the pillars have to withstand more weight than ever), but the Camaro’s are still thicker than any I can think of. Its “Pillbox” styling results in sight lines that are downright dangerous. 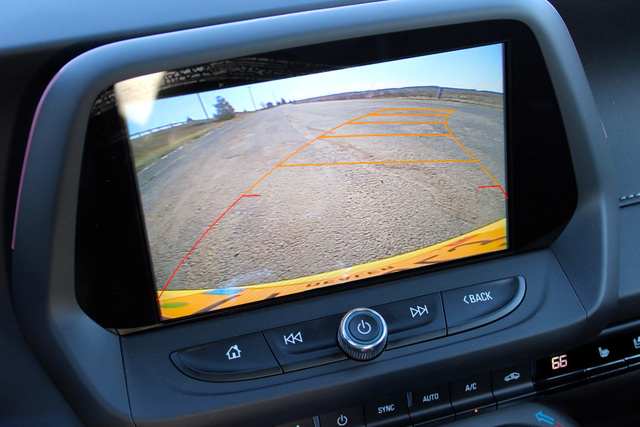 You can add all the backup cameras and blind-spot monitoring systems you want, but a more common-sense approach to driver visibility needs to be considered in future vehicles. 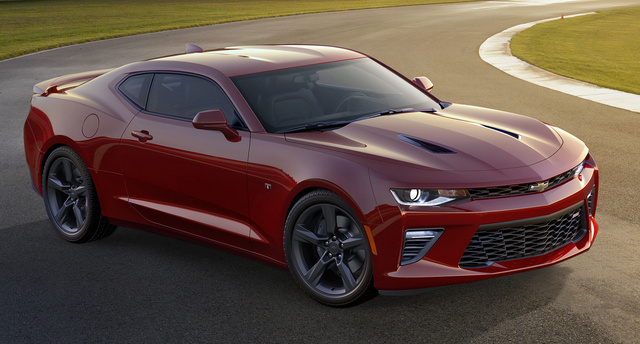 The 2016 Chevrolet Camaro starts at $25,700. A 2LT automatic 4-cylinder starts at $29,800 and includes push-button start, an 8-way power driver’s seat, heated and ventilated front seats, dual-zone climate control, a Bose premium stereo, and the 8-inch MyLink touchscreen. Our test model was a 2LT and included the V6 (a $1,495 option), 8-speed automatic (another $1,495, including remote start), dual-mode performance exhaust ($895), the RS Appearance Package ($1,950), and the Convenience and Lighting package ($2,800). All told, with other small add-ons, our test car came in at $39,940. That’s about $3,500 more than the starting price of a V8 Camaro ($36,300), but start to add options and a loaded-up SS automatic convertible will easily pass $55,000. For the sake of comparison, the Ford Mustang starts at $24,145, and a 4-cylinder EcoBoost Mustang starts at $25,645. The most similar configuration to our test model would be an EcoBoost Premium trim (which makes more power than the Mustang V6, but still not as much as our Camaro's V6) with similar options and would cost roughly $37,000. A Mustang GT V8 starts at $36,395, while a loaded Mustang GT V8 Premium Convertible with plenty of options doesn’t even cross $50,000. If you need that V8, expect to pay more, but know that the cost savings between GM and Ford once you're up in V8 territory will be minimal. But if you prefer daily creature comforts to the roar of a fuel-thirsty V8, our 2LT V6 Camaro is a fun, effective compromise between fun-to-drive performance, efficiency, and practicality. What's your take on the 2016 Chevrolet Camaro? 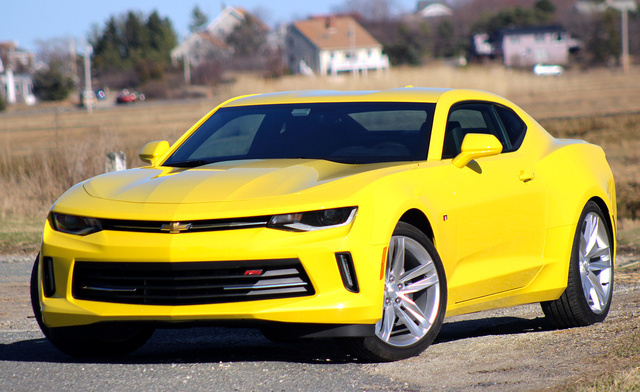 Have you driven a 2016 Chevrolet Camaro? I was driving and my radio. Went completely blank in my car but it came back on one and never did it again. Anyone have this issue ? Do Listed Prices Include TAX? When I gun it a little fast it loses all power then catches back up. Is this safety for transmission.